From World War 1 in 1914, through to the Second Gulf War in the 2000s, there has been a Burridge man fighting on the field of battle for Australia. On Friday night, members of the Burridge family will be on the field together but this time the stage will be the sporting field when Fremantle take on Richmond at Patersons Stadium. Vietnam Veteran and Medal for Gallantry recipient John Burridge Jnr along with his sons James and David Burridge, who both served in Australia and abroad with the Australian Infantry, will perform the National Anthem at the annual Len Hall Game. 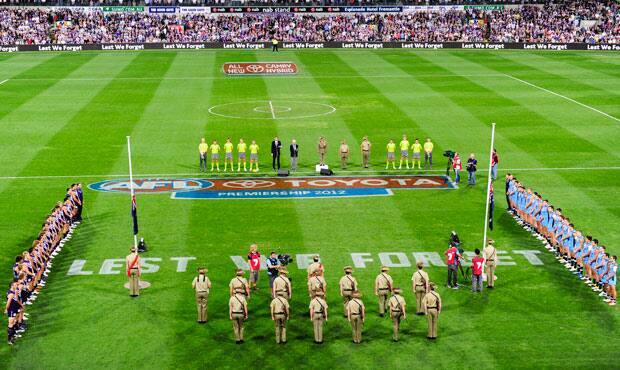 Now in its 18th year, the Len Hall Game is a great Fremantle Dockers tradition that honours the Anzacs. The Burridge family’s military history runs four generations deep. An ancestor died during the battle at Fromelles inWorld War 1, while John Jr’s father, John Sr, served in East Timor between 1941 and 1942. John Jr won the Medal for Gallantry with the 5th Battalion Royal Australian Infantry Regiment in Vietnam in 1969. His son David was a reservist in East Timor in 1999 when the situation in the country worsened and became a full-time member of the Army. He later served in Iraq between 2004 and 2006. James served four years with the 11th/28th Battalion, based in Karrakatta. David said it was a huge honour to sing the National Anthem on an occasion that holds the dearest place in his family’s heart. “We’re such a staunch military family for Australia, we pretty much cover every unit Western Australia has sent over to war,” he said. “It’s about my family, and on a personal level, it’s about my friends. David said Freo’s initiative to host the Len Hall Game every year was one of the best traditions in Australian sport. “Our family have always been staunch Freo Dockers’ supporters since day one, so good on the club for doing that,” he said. This year’s Len Hall Game features veterans who represented Australia during the Vietnam War, where John Jr won his Medal for Gallantry in 1969. His story is a great example of the bravery and resilience our war heroes have displayed throughout the history of this country. Private John Burridge commenced his National Service obligation on 1 May 1968 and after recruit training was posted to 5th Battalion, The Royal Australian Regiment on 9 July 1968. He arrived in South Vietnam on 15 February 1969 as a machine gunner in 11 Platoon. On 4 April 1969, while on Operation Overlander, 11 Platoon came under heavyenemy machine gun and rocket fire from a bunker position at a range of 20 metres. Two members of Private Burridge's section were killed and the Section Commander wounded. Private Burridge moved forward, on his own initiative, to a position 15 metres from the enemy and commenced engaging the bunkers. He maintained his position for over an hour and effectively prevented the enemy from moving to other bunkers on the flanks of the platoon. His actions drew most of the enemy rocket fire onto his position and as a result he was wounded in both legs. Despite his wounds and further enemy engagement of his position. Private Burridge continued to fire on the bunkers and restrict the effectiveness of the enemy fire until the remainder of the platoon could move to new positions. His courage and his complete disregard for his own safety were major factors in preventing further casualties to the platoon and his conduct was an inspiration to all.